Extracorporeal shock wave lithotripsy is a nonsurgical treatment for kidney stones. It uses high-energy shock waves to break the stones into tiny pieces. The pieces can then be passed with urine. Most people who have lithotripsy for kidney stones are free of stones within 3 months of treatment. 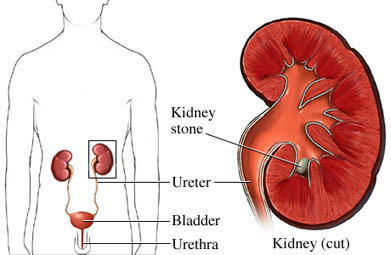 Those with stones in the kidney and upper ureter have the most success with treatment. There may be fragments that are too large to pass after the procedure. They can be treated with lithotripsy again. Heavy sedation or general anesthesia is usually used. Heavy sedation will keep you calm. With general anesthesia, you will be asleep through the procedure. You will be placed on a soft cushion on top of a table. Shock waves can be passed to the stones through this cushion. X-rays or ultrasound will be used to locate the stone. Your body will be positioned to target the stone. Shock waves will be passed through the stones until they are crushed. They will be crushed into pieces as small as grains of sand. Anesthesia prevents pain during the procedure. There may be some pain and discomfort afterward from the passage of broken stones. There may also be some bruising on the area treated. Pain and discomfort after the procedure can be managed with medication. You will be able to move almost immediately after the procedure. Drink plenty of water in the weeks after the procedure to help the stone pieces pass. Lithotripsy. National Kidney Foundation website. Available at: https://www.kidney.org/atoz/content/lithotripsy. Accessed March 8, 2018.